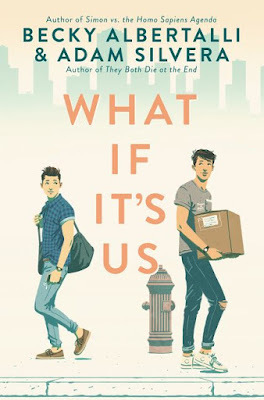 Becky Albertalli, who wrote the acclaimed Leah on the Offbeat and Simon vs. the Homo Sapiens Agenda, which became the hit film Love, Simon; and Adam Silvera, renowned for They Both Die at the End, have collaborated for the highly-anticipated What If It's Us. Albertalli and Silvera were introduced by their mutual literary agent five years ago while they both were in the midst of writing novels starring gay main characters. They became fast friends before they ever actually met in person. Their collaboration was inspired by an anecdote Becky shared with Adam about a Missed Connection she posted on Craigslist a decade earlier, and they put their heads together for the story of Arthur and Ben, two boys who meet in a New York City post office. The writers spent three years crafting this novel together over email and by phone, with Albertelli writing from Arthur's perspective and Silvera writing as Ben. The romantic comedy begins when Arthur's and Ben's fates collide at the post office, where Ben is shipping his ex-boyfriend's things back to him. Their attraction is mutual, but circumstances get in the way of them trading phone numbers. Is the universe pushing them together or pulling them apart? This is a fresh, clever love story about serendipitous encounters, failed first dates, and second chances that is wrapped in the heart and honesty these authors are adored for. What If It's Us is one of the best stories you will read all year, from two of the most creative young adult writers around.